In a man’s chart, Venus represents the type of (young) woman to whom he is attracted. The mythological Venus is Aphrodite, the goddess of love and beauty. 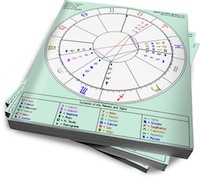 The planetary Venus does not travel beyond two zodiac signs from one’s Sun, meaning that a man with Venus in Cancer can only be a Taurus, Gemini, Cancer, Leo or Virgo. In general, this man will be drawn to a maternal type, a woman who will nurture him with her cooking or with her sensitive attendance to his emotional needs. The Cancer figure tends to be on the shapely side — think of the stereotypical mother’s warm bosom. A Cancer man will obviously be the most straightforward to please in this manner, as his Venus seeks similar expression to his Sun. However, when a man’s Sun sign is different than his Venus sign, attraction gets more complicated. A Leo man likes glitz and glamour, and his attraction to a shy, empathic cuddle bunny may be at odds with his desire to be seen in public with a trophy wife who serves as an accessory to boost his image. To attract this type of man, one would need to encase the caretaker in a slinky dress — to be the wild Moon to his Sun. [ad]A Virgo man may be more comfortable with his Venus in Cancer, as both signs are on the introverted side. However, his critical tendencies and analytical mindframe are not at home in the world of emotions. He may project his Venus onto a woman (meaning that he disowns his Venus and makes a woman “take the Cancer on” for him) and then end up hurting her feelings by picking her apart. To attract this type of man, one would need to have enough self-confidence to not take his feedback personally, yet be receptive to his home cooking reviews … if they have any merit. A Gemini man may have a hard time incorporating his Venus in Cancer because his propensity towards variety and exploration threatens the part of him that craves emotional security. He consciously wants to play the field, yet he’s drawn to a woman who wants him to stay at home with her to watch the Lifetime channel. To attract this type of man, one needs to be able to be caring without being smothering, and to provide a home base without insisting that he’s home all the time. A Taurus man may have the easiest time with his Venus in Cancer (other than the Cancer man). Both Taurus and Cancer crave security and safety. Taurus grooves on being fed and nurtured. He may not be as emotional as the woman to whom he is attracted, but if she can translate her love into sensual acts and the creation of home-made knick knacks, she’s sure to have his heart. The last three guys who have tried to pursue a relationship with me (I picked ONE, haha) all had venus in Cancer. One was a Leo and I guess he liked how I looked and carried myself. I am a taurus, and I like using feminine, natural things…. so they might be attracted to that…haha? I have a Virgo friend with Venus in Cancer. Before I checked his birth chart, I knew he was a romantic. Beatles love song? Cooking? Oh my. We often host dinner parties and cook together. Which is great. Though he is a neat freak. Oops, I meant to write you must NOT be afraid to let your sensitivity show. I knew a Gem man with Venus in Cancer. He had a friendly, frumpy and incredibly comforting/nurturing girlfriend who put up with his constant crushes on beautiful, mean, flashy Leos. I am a gemini sun, moon in cancer and venus in taurs with an almost obsessive crush on a guy with a gemini sun, moon in taurus and venus in cancer. I’m glad these post were written because it shed’s light on how he may act! I am dating a great (but insecure, very emotional) guy with his sun in leo, moon in virgo, venus in cancer and mars in leo… I on the other hand have my sun in virgo, moon in virgo, venus in leo and mars in leo… Will this work…?? Wow morrigan you have the same case as me except the guys mars is in Gemini .. can you tell me more about how he was before falling in love and afterwards?? I’m very intrigued? I have sun in Gemini, moon in sagittarius, mars in capricorn, venus in cancer. I like to think Im special. interesting comments…very insightful. I just so happen to be one of these Gem/venus/cancer men with venus in cancer. I am admittedly pretty close to these descriptions. I can safely say I have a unconscious desire for a variety of women. That being said it’s only a superficial desire…just in passing really. Its not something I deep down desire. Truly, that would be something different altogether. I am a virgo who has venus and mars in scorpio. My boyfriend is a taurus who’s venus is in cancer and mars in virgo. Any advice? Jara aka Blah Blah lol you still lookin? i here!